Click the pictures to see them larger. Rose is from Italy, Atila from Brazil. They met first at the Red Sea while diving, their very passion. 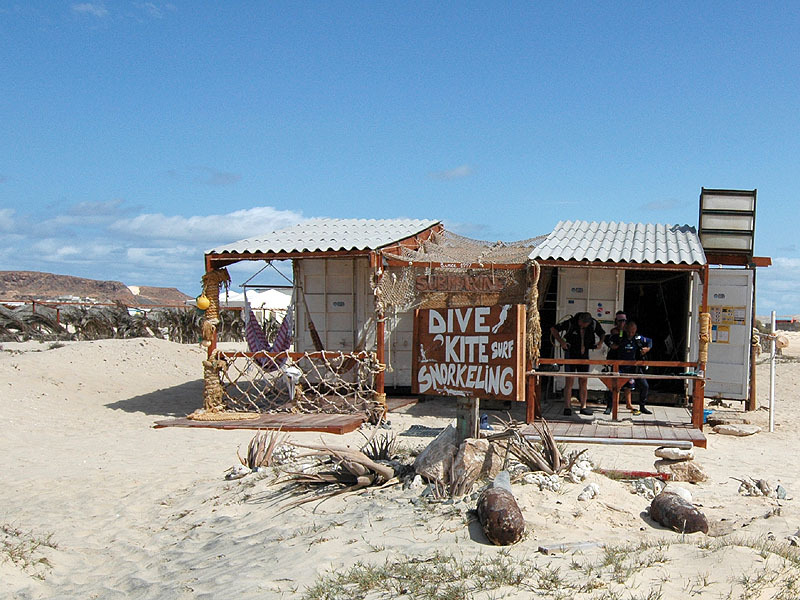 1997 they opened a diving center at the beach of Boa Vista - the only one for the time being, but a special one with excellent service. Group size is restricted to five. Atila shows the Atlantic to a mountaineer - from the bottomside! Some doubts took hold of my soul when descending from the hight of Cape Verdean mountains to the depth of the Atlantic. 50 meters from the Dive Center, the boots have changed for fins and there is no way back. ... will I become a fish or its food? there are no fig-trees in the sea. Not spitting the hands but the mask will help. And listen precisely to what Atila has to tell about the secrets of valves and weight belts and makes you try - while still feeling the ground safely beneath your feet. Thanks to Atila's pacient instructions, everything went perfect at first try. At the shore of Ilhéu de Sal Rei we find a lot of fish. The bigger ones are well known friends from the fish-market. But the small ones, floating silently with the current by the hundred in perfect co-ordination is a new impression. Happily back from a glimpse at the world of Rose und Atila! Languages: English, French, Italian, Portuguese. updated: 16.11.2008 Thanks to Rose und Atila!